Arburg is one of the leading manufacturers of high-quality injection molding machines for plastics processing. Arburg and DOPAG France have been working together successfully for 25 years. 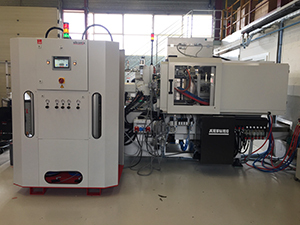 In France, the new silcomix PE 200 now was connected to Arburg plants – a new step in the cooperation. The silcomix type PE200/20 offers reliable production within a wide range of applications. It processes almost all LSR materials – from extremely low to high viscosity. In the series production of silicone products, the DOPAG silcomix meters and mixes very precisely the two components of liquid silicone. This exact mixing ratio is ensured by the new SWIPSYNC technology. The plastic parts are then moulded and cured on injection moulding machines from Arburg. The successful partnership and many years of experience of both companies provide the worldwide customers of Arburg and DOPAG an important competitive advantage.